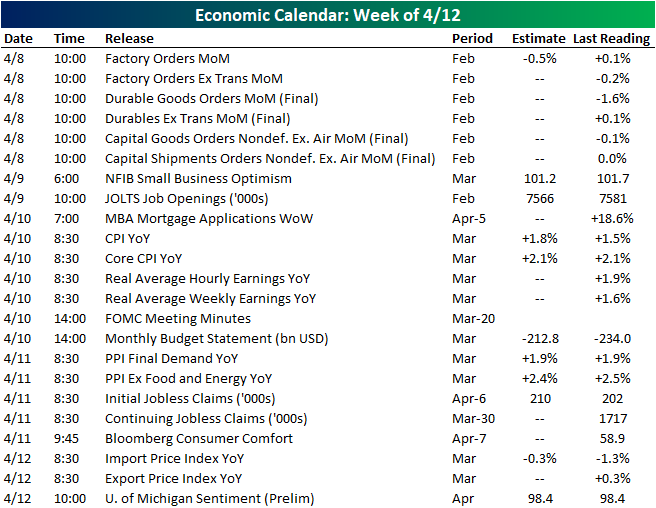 It was a mixed week in economic data last week as the same number of releases that beat either estimates or the previous period also missed. Yet another weak retail sales report for February kicked things off on Monday. Rather than another increase like in January, the February data showed worse sales across the board. Also out on Monday was the ISM Manufacturing PMI which came in stronger as well as improved Construction Spending in February. Tuesday saw a mixed Durable and Capital Goods print, though Vehicle Sales were solid in the US with 17.50 mm vehicles SAAR. On Wednesday, MBA Mortgage Applications continued to see strong demand as rates have fallen. 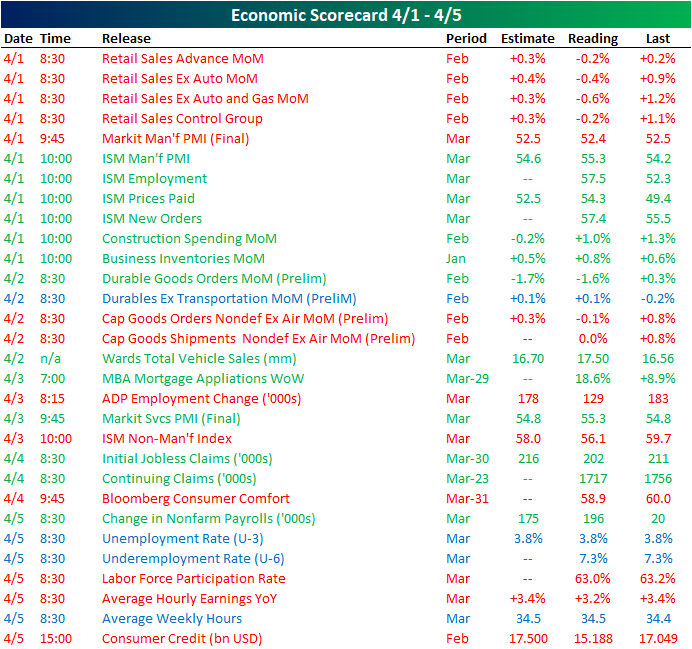 The second half of the week saw solid labor data as Initial Jobless Claims came in at the lowest level since 1969, and following a very weak 20K change last month, the Nonfarm Payrolls report saw solid job creation in March. Final Goods Orders and Factory Orders for February were released this morning. Factory Orders declined in line with expectations of a 0.5% drop MoM. Tomorrow, the NFIB releases Small Business Optimism data for the month of March. Whereas February saw a print of 101.7, the March number is forecasted to weaken to 101.2. JOLTS Job Openings will be out later that day which is also expected to come in slightly weaker. CPI for March will come out on Wednesday. While headline inflation is forecasting a pick up, the Core reading is not expected to see any change. The FOMC’s Meeting Minutes from their March 20th meeting will also come out that day. CPI’s producer counterpart will come out the following day with the opposite expectations: the headline reading is not expecting any change while the core reading is expecting a decrease from February. Preliminary University of Michigan Sentiment for April will round out the week on Friday. Start a two-week free trial to Bespoke Premium to access our interactive economic indicators monitor and much more.